The Army made a stunning admission earlier this month when it announced its decision to require a deeper environmental review and more extensive consultation before deciding whether to grant an easement for the Dakota Access Pipeline. In its consultations with the Standing Rock Sioux about the pipeline crossing underneath Lake Oahe within a half mile of the reservation, the U.S. Army Corps of Engineers purposefully withheld key studies that could have helped the tribe evaluate the risks. One report modeled damage from potential spills; another weighed the likelihood of spills; a third compared alternative routes and discussed the environmental justice concerns raised by the project. The revelation highlights the federal government’s perception of its limited responsibility to consult with tribes even on matters that could threaten its welfare. 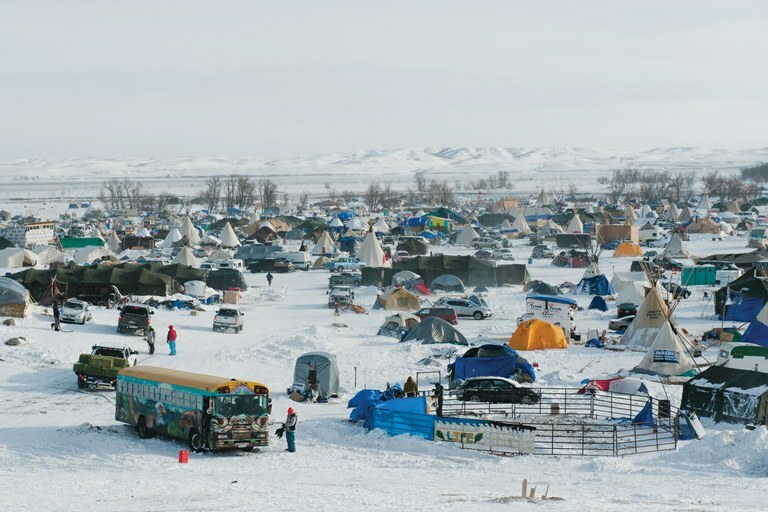 Thousands of people camped at Oceti Sakowin camp in Cannon Ball, North Dakota, a few days after the Army Corps of Engineers announced it would deny the easement to build the pipeline under Lake Oahe. A few hundred are prepared to stay for the winter. The contents of these documents, which have still not been released to the public, are unknown. “There’s this secret stuff that even we don’t have in the litigation. We were aware there were documents not available to us and we’ve been asking for them, ” Jan Hasselman, the tribe’s chief lawyer, says. But the Army maintains it both was and is on firm legal footing. “I want to be clear that this decision does not alter the Army’s decision that the Corps’ prior reviews and actions comported with legal requirements,” Jo-Ellen Darcy, assistant secretary of the Army wrote in a memorandum Dec. 4. “Rather my decision acknowledges and addresses that a more robust analysis of alternatives can and should be done under these circumstances, before an easement is granted for the Dakota Access Pipeline to cross the Missouri River on Corps land.” Her memo directs the Corps to release those documents that it had withheld from the tribe. In early December, the thousands of protesters camped at the Standing Rock Sioux Reservation celebrated what appeared to be a massive victory. Without the easement, the $3.8 billion pipeline project was stalled. But the fight is far from over. The 1,172-mile pipeline, designed to carry Bakken crude oil to refineries in Illinois and beyond, would pass within half a mile of the reservation and underneath Lake Oahe, which the tribe relies on for drinking water and treaty fishing and hunting rights. “They’re making a stand because they’re afraid of what might happen if there’s a spill, which happens all the time,” says Native American attorney John Echohawk, founder of the Native American Rights Fund. An earlier pipeline route that would have crossed the Missouri River 10 miles north of Bismarck was rejected for a variety of reasons, including potential risk to the water supply for that larger, whiter, more affluent community. The “water protectors” at the Oceti Sakowin camp near the reservation responded to the news with resolution as well as joy. John Bigelow, an enrolled Standing Rock Sioux, wore a black beanie reading “Water Is Life” as he told a news conference: “We are not going anywhere.” But later that day, a fierce winter storm hit, and Standing Rock Sioux Chairman Dave Archambault II urged protesters to leave. Thousands did. “While this phase of the struggle relied largely on the protectors at camp, this next stage will be focused on the legal battles,” Archambault said in a statement. The Standing Rock Sioux’s triumph — delivered in the waning days of the Obama administration — is only temporary. The Army Corps committed to a more robust analysis of the pipeline’s potential environmental impacts, likely halting construction for months or even a couple of years. But President-elect Donald Trump supports the pipeline, in which he held a financial interest until recently. So the future remains murky at best: “What will happen in an anti-science, anti-Indian and pro-fossil fuel administration, we’ll just have to see,” says Hasselman, an Earthjustice attorney. The protests gained steam in late summer, after the Standing Rock Sioux filed suit to stop pipeline construction, claiming that the government failed to adequately consult with the tribe and that the Corps’ expedited environmental review was not thorough enough. After the tribe asked for a preliminary injunction to stall construction, a federal judge in September ruled that the Corps had met its obligation to consult with it, saying that tribal representatives repeatedly failed to attend meetings. In response to protests and political pressure, however, the Department of the Army, the Justice Department and the Department of the Interior stepped in to block the project while the Corps reconsidered. That led up to the Corps deciding that a full environmental impact statement is necessary. Experts say it will be difficult for the Trump administration to evade this time-consuming requirement, which entails extensive study and significant input from the tribe and the public. Failure to conduct it would probably be seen by a judge as “arbitrary and capricious,” says Carpenter. The same is true for the Army’s commitment to a higher level of consultation with the tribe, including releasing those documents formerly withheld from the tribe. The judge has refused to rule immediately, saying he’ll consider the company’s request early next year. The tribe’s lawyers seem confident that it will fail but some industry experts disagree. The Standing Rock Sioux and their supporters hailed the Obama administration’s decision to require further review and to release the documents, even though they didn’t get what they wanted: a permanent rejection of the easement to cross the river. “It buys time in this fight,” says Raúl Grijalva, D-Ariz., the ranking Democrat of the House Natural Resources Committee. Another version of this story appeared in the print edition of High Country News. Contributing editor Tay Wiles contributed reporting.